The evolution of activism against the expansion of copyright in the digital domain, with case studies of resistance including eBook and iTunes hacks. The movement against restrictive digital copyright protection arose largely in response to the excesses of the Digital Millennium Copyright Act (DMCA) of 1998. 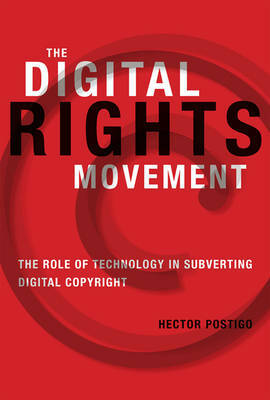 In The Digital Rights Movement, Hector Postigo shows that what began as an assertion of consumer rights to digital content has become something broader: a movement concerned not just with consumers and gadgets but with cultural ownership. Increasingly stringent laws and technological measures are more than incoveniences; they lock up access to our "cultural commons." Postigo describes the legislative history of the DMCA and how policy "blind spots" produced a law at odds with existing and emerging consumer practices. Yet the DMCA established a political and legal rationale brought to bear on digital media, the Internet, and other new technologies. Drawing on social movement theory and science and technology studies, Postigo presents case studies of resistance to increased control over digital media, describing a host of tactics that range from hacking to lobbying. Postigo discusses the movement's new, user-centered conception of "fair use" that seeks to legitimize noncommercial personal and creative uses such as copying legitimately purchased content and remixing music and video tracks. He introduces the concept of technological resistance-when hackers and users design and deploy technologies that allows access to digital content despite technological protection mechanisms-as the flip side to the technological enforcement represented by digital copy protection and a crucial tactic for the movement.